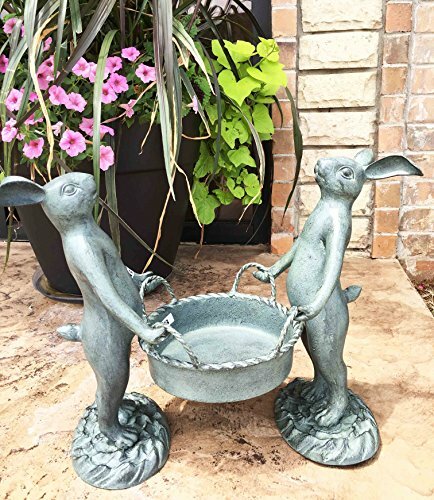 Whimsical Hardworking Bunny Rabbit Gardeners Flower Pot Planter Holder Garden Decor Aluminum Statue For Pool Patio Decoration Functional Nature Outdoor by Gifts & Decors at Tulips Orchids. Hurry! Limited time offer. Offer valid only while supplies last. Decorate your garden or poolside with this whimsical bunny planter statue. It is made of hardened aluminum construction safe for outdoor use. Statue measures 15.5" tall, 20.5" long and 8.5" deep when assembled. Our brand of home and garden decors is specially dedicated to bring a whimsical, unique and elegant look to your space!! !